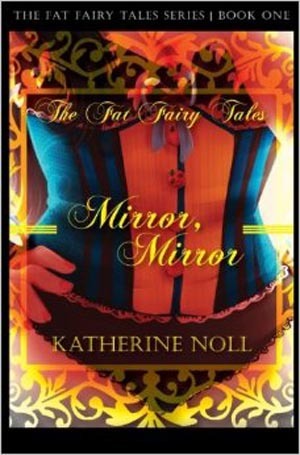 The Fat Fairytales… A Big Fat Series from Katherine Noll! What if Cinderella had a little junk in her trunk? If Snow White could pinch more than an inch? If fairytales were set in America today, where the average women weighs 164.3 pounds and wears a size 14, these famous princesses would surely be more than wispy waifs. It’s obvious that plus-sized women want to see themselves represented on television and the big screen. Break-out hits like “Hairspray,” “ Drop-Dead Diva” and “Glee” show curvy women living full, exciting lives with plenty of romance. So why shouldn’t a modern day Cinderella still get her prince? And fairytales are Hollywood’s latest trend. Grown-up versions of kids’ classics have hit the big screen in recent years, including Snow White and Little Red Riding Hood. Popular television shows like “Once Upon a Time,” “Grimm,” “Sleepy Hollow” and now “Once Upon a Time in Wonderland” all speak to the universal love of fairytales. In the Fat Fairytales novels, readers will experience a new twist on old classics. The fresh take on these familiar characters will resonate with readers and allow them to dream of when their prince will come. But size isn’t everything. These modern retellings offer humor, fast-paced action, and lots of red-hot passion. Imagine if Janet Evanovich collided with Hans Christian Anderson at an all-you-can-eat buffet! Every fairytale has its moral, and the Fat Fairytales are no different. The title characters have to overcome low self-esteem and embrace themselves to truly have a happy ending. It’s a message that no matter who a person is or what they look like, nobody should sit on the sidelines and miss out on life for any reason. Seize the day and get the prince! LEARN MORE ABOUT NEVE BIANCA AND HER ADVENTURE BY PICKING UP MIRROR MIRROR, CLICK HERE!